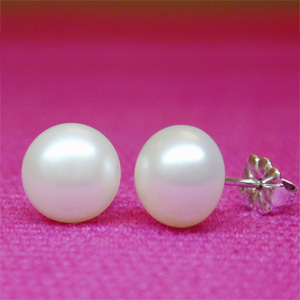 If your looking for that perfect set of pearl white stud earrings don't look any further. These 7 mm white button freshwater earrings are just the thing. If size matters these pearly whites are available in 7 mm and 9 mm select from below what you prefer. Click on image to view enlarged picture. Please visit AMERICAN PEARL for Fine Quality Cultured Pearls. Please visit AMERICAN DIAMOND for Fine Quality Diamonds.